Farnsworth during the peak of his Yetiism (6ACV18). 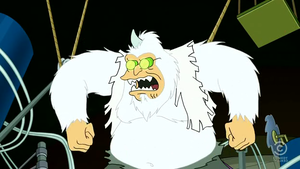 Yetiism is a disease caused by the Yeti pineal gland, which contains a concentrated form of the Yeti neurotoxin. According to Zoidberg: "It mimics the symptoms of hypermalaria exactly. Except for the part where, instead of dying, you turn into a Yeti!" Farnsworth had Yetiism from 2927 until 3011 (6ACV18). The word Yetiism is very similar to the word Jediism. This may be a reference to Star Wars. Fry: [On seeing Farnsworth during the peak of his Yetiism.] My God. He's like some kinda believable Hulk! This page was last edited on 23 October 2011, at 18:00.